The people at Planet Rush must have read my mind. 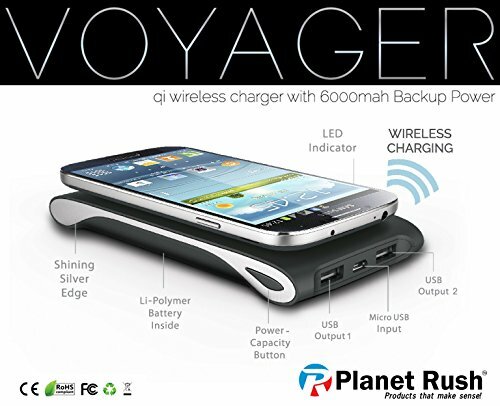 I thought about creating a device like the Voyager Wireless Charging Station and Power Bank when I first discovered Qi wireless charging. This device allows you to wirelessly charge a Qi compatible device. It also works as an external battery. Works as advertised. It charges my Samsung Galaxy Note 5 quickly with no issues. Because the device doubles as a battery and a wireless charger, the battery is always charged. 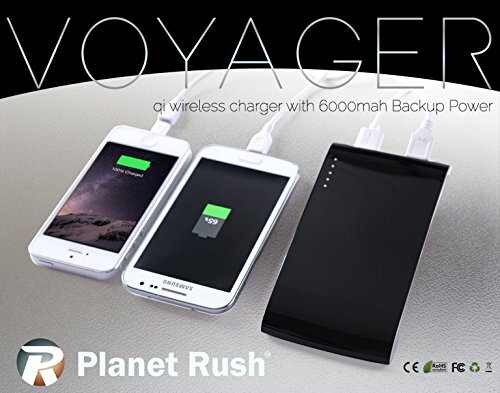 This is a huge benefit because, if I forget to charge my phone, I can simply take the battery with me and charge the phone on the go, wirelessly. How cool is that?!?!? It has a solid, sturdy build and an attractive design. The styling of the device is a nice bonus. It looks pretty cool on my desk. Coupled with a pair of short USB cables, you can charge three devices while maintaining a neat set up. Unlike most external batteries, you won’t forget to charge this one because it needs to be plugged in to charge your phone. The surface of this unit is a bit smooth. My Note 5 case is also smooth so the phone. I don’t like how easily the phone slides around. I wish the battery was bigger. If they sold a different unit with a bigger battery, I’d buy it. I wish the unit was a bit cheaper (or the batter was a bit bigger). Should You Buy the Voyager Wireless Charging Station & Portable Power Bank? I have several great wireless chargers and the Voyager Charging Station/Power Bank has become my favorite. It works as advertised- it charges my phone wirelessly and works as an external battery. This combination of uses is why you should buy this device. Yes, you could get a cheap external battery and a cheap wireless charger. I just think it’s better to have an all-in-one unit because you are more likely to keep the battery charged. The device isn’t cheap but it works well and looks great. Sometime is cool to pay a little extra for something cool. Definitely recommended!